With our focus on healthy meals for young children and teenagers we have come up with some exciting and new school lunch food ideas for Ben. We want to share one of them with you in this easily prepared wrap. Years ago and before we knew any better, Ben would take a Lunchable to school for his lunch time meal, turns out they have scores of preservatives, and multi-syllable words that go beyond normal food ingredients. And these ready made “lunches” are not cheap; some can run over $3.00 each, which adds up to over $15.00 a week in lunch time meals for each child. Currently the school lunch program in Wake County costs $2.00 per meal, but the selections are not that great either. So we decided to make some better lunch meal alternatives for Ben’s school meal break. Recently we have been making some quick to fix sandwiches, and this wrap is another wonderfully tasty lunch that anyone would enjoy at school, or home for that matter. It only takes about 5 minutes to prepare this wrap, between getting up in the morning and breakfast, and then it is placed with a frozen ice pack in the insulated carrier along with a drink and a side item, such as either crackers or cookies. 1. Spread tortilla evenly with the cream cheese, and then cover with an even layer of the peach preserves. Sprinkle the shredded cheddar cheese evenly over the preserves. 2. 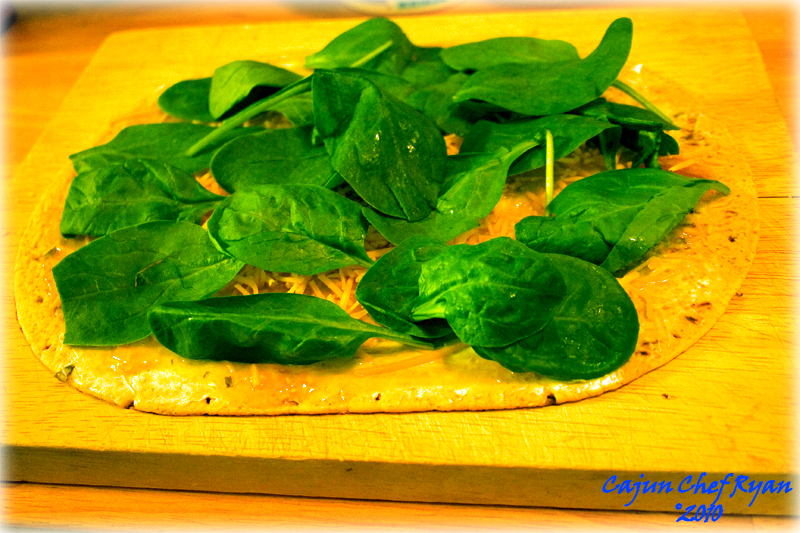 Arrange the baby spinach leaves evenly over the top of the heese, then add the turkey in one even layer. 3. Tightly roll the tortilla, leaving the seam side down. Cut in half using a serrated edge knife. Southwest Turkey Wrap – Substitute salsa in place of the peach preserves, use shredded pepper jack cheese in place of the cheddar, and use ½ cup of shredded romaine lettuce in place of the spinach leaves. 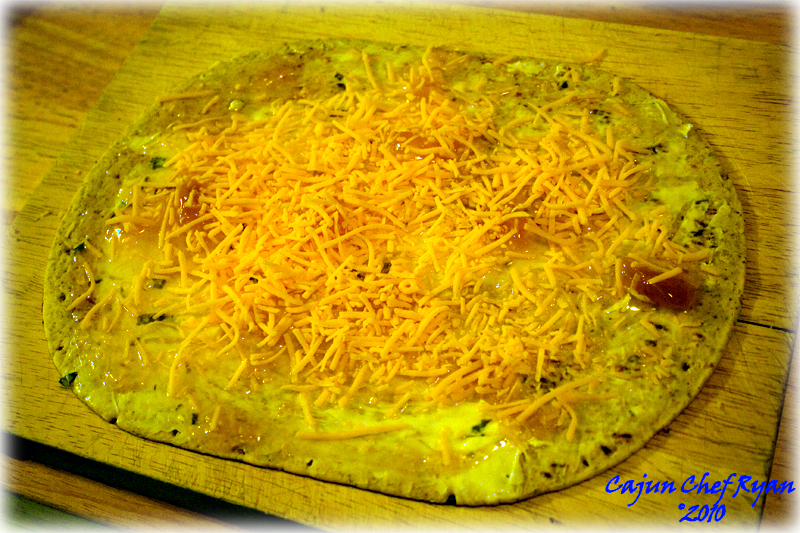 Spicy Cajun Ham Wrap – Sprinkle about ½ teaspoon of Cajun Spice blend over the cream cheese, then substitute hot pepper jelly in place of the peach preserves, use ½ cup of thinly shredded cabbage in place of the spinach, and then use thinly sliced ham in place of the turkey. NOTE to parents: Some young children may not be able to handle the spiciness of this wrap. Make your own wrap variation and let me know what you came up with! My daughter always had lunches made at home because, as we all know, most school lunch fare barely qualifies as food. Your peach wrap looks delicious – I’d like one for lunch! Kudos to you and all parents who make the effort to provide their kids with tastier and healthier lunches! Chef – I’ve never seen wraps in that oblong shape before..luv it! 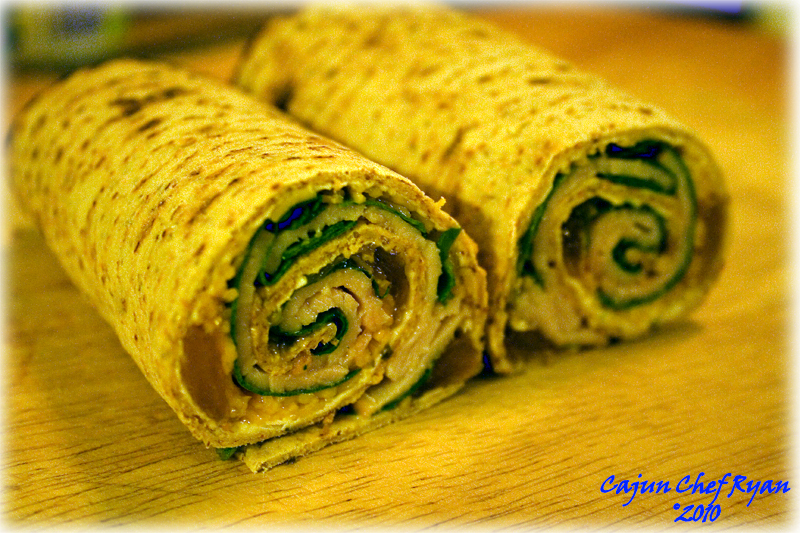 Good stuff in these wraps…inspiring for my hubby’s lunches. 🙂 Have a great weekend! I love it! The combination of flavors must have been delish! So glad to hear from another parent who takes the effort to put some love and care into their children’s school lunch. You are so right, in fact I just ate one myself! 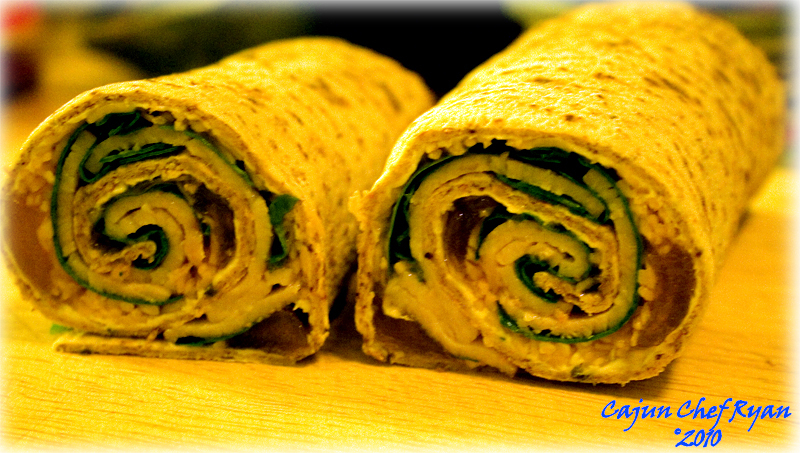 The oblong wraps are made by “FlatOut” and come in various flavors, such as the spinach variety is quite good. very very nicely done love the rolls they are great for everyone! hey, that’s a great wrap Ryan… Ben is lucky to have caring meals, bet other kids are wanting to swap… love the ham one, but you know I would right? Perfect healthy and delicious lunch, great for us big kids too! The peach preserve is a great way to bring some sweetness to the wrap. What a delicious and healthy sounding lunch! Sure anyone can eat these wraps. Not only healthy, but only take about 5 minutes to make. I knew that my Southern podna! Indeed, so much so, that Ben requested to leave the preserves out the next time!